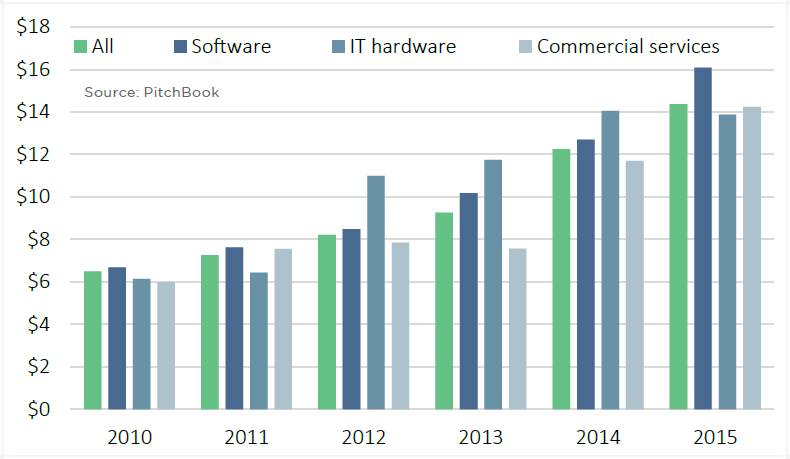 How have venture valuations shifted in response to the downturn in activity? Our recently released VC Valuations & Trends Report examines multiple datasets of U.S. venture valuations in order to assess both the historic, recent ramp-up in the industry as well as the effects of the recent shift downward in activity. Knowing not everyone has time to read through a packed 20-page report, we pulled 10 of the top charts featured in the report for a visual summary. To get free access to the full report, click here. 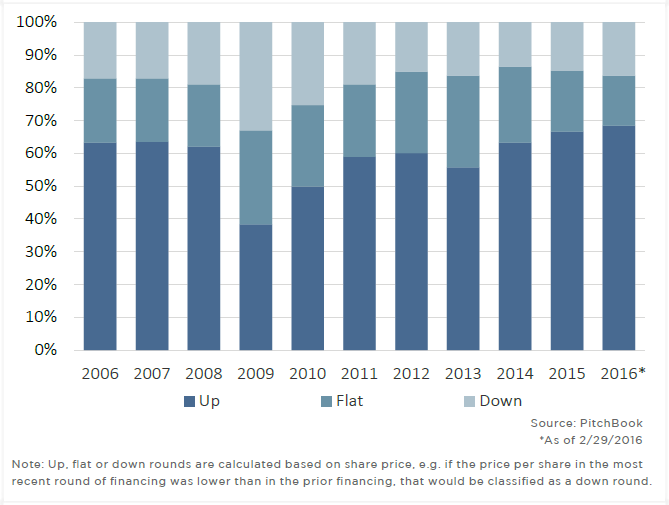 Median early-stage pre-money valuations ($M) by year in U.S.
Only Series B valuations have seen a slide, albeit modest. 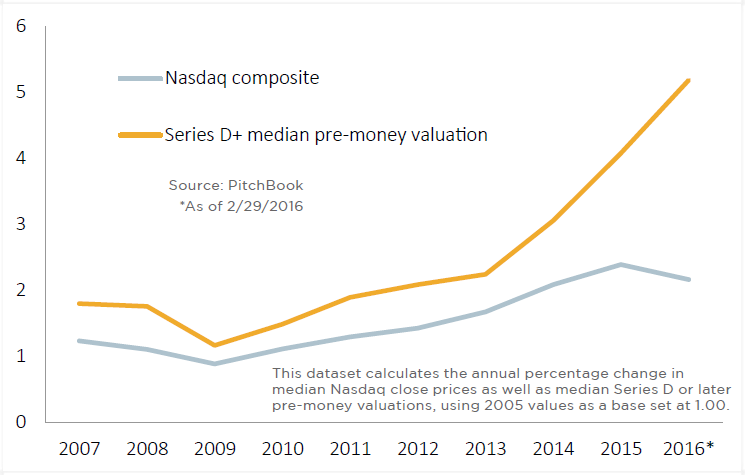 Median late-stage pre-money valuations ($M) by year in U.S.
A surge that apparently continues unabated into 2016. 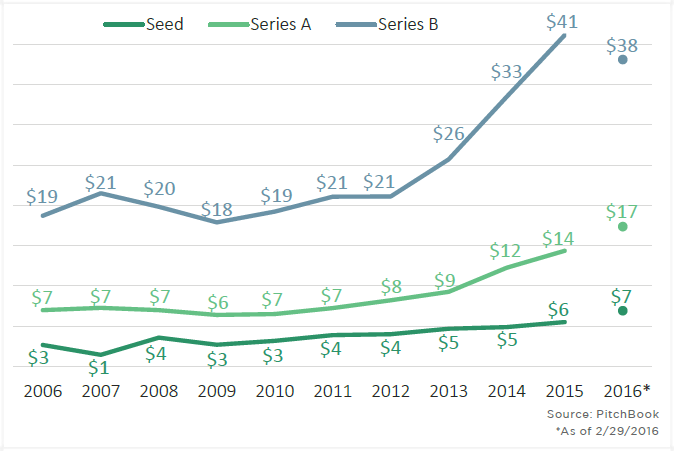 The crop of startups vying for Series A dollars has exploded, and valuations have remained more than healthy. The only companies still even raising at Series D and later are the ones that enjoy the most investor confidence. 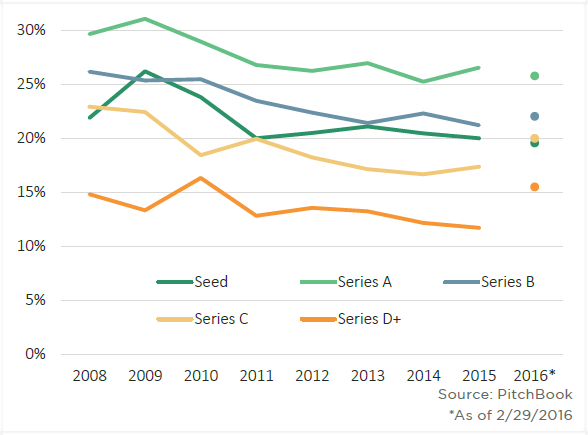 Median % acquired by series and year in U.S.
Investors have used the reset in order to shift terms already, particularly at the late stage. It’s no secret that companies have been staying private for longer and longer for a variety of reasons. Hedge funds’ participation is considerably off in 2016 so far (for more on this subject, click here). Corporate venture arms will continue investing in robust startups whose focuses align best with their parents. 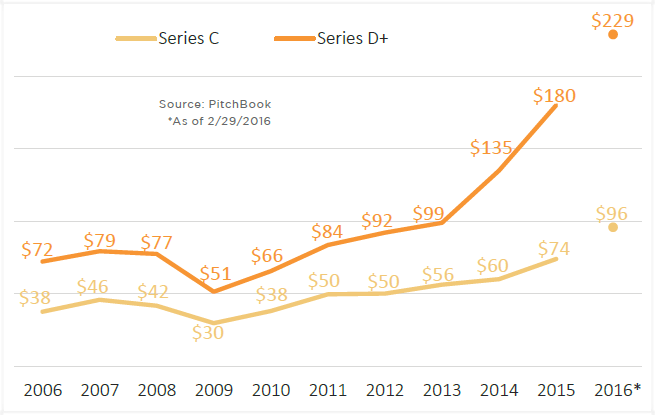 Series B and C financings have seen the starkest increases in time between rounds. 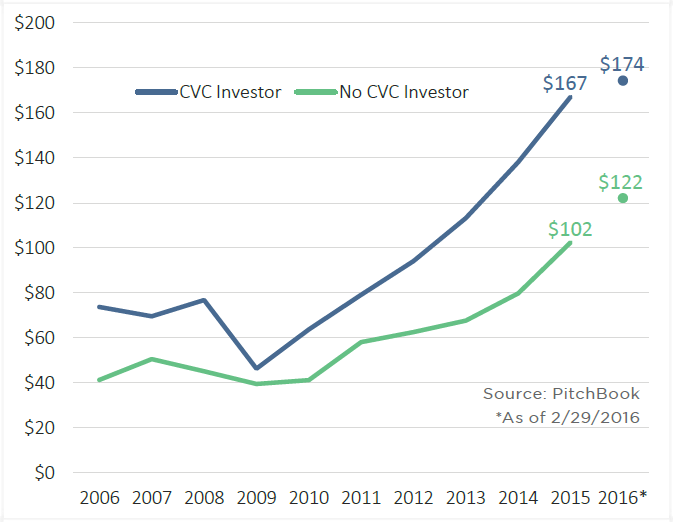 VC investors are either willing to be persuaded to re-up even in a down round—in order to recoup later—or don’t need to be. 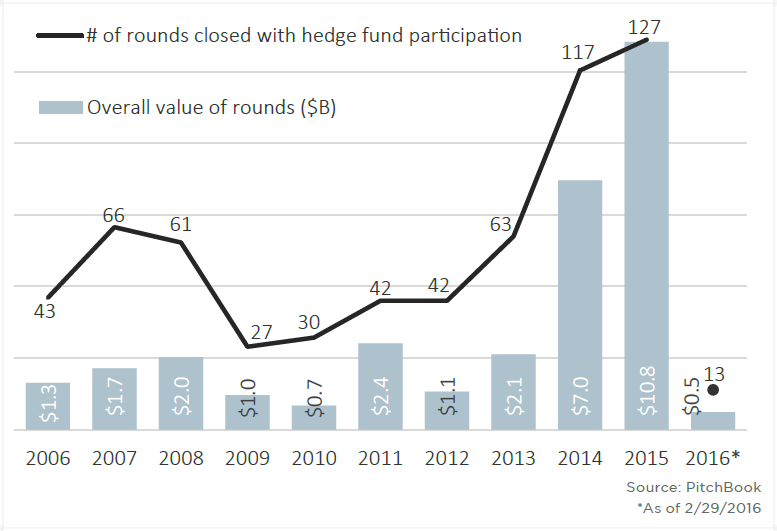 2016, though, has seen a record pace of down rounds. Are you interested in this data? Contact us today to see how the PitchBook Platform can help inform your business decisions. You can get free access to all of our reports by clicking here.